Hi! How are you? It's getting more and more chilly here in Denmark. The worst is the wind - but I guess that's what you get living right by the seaside. Today's outfit is something different that I'm not even sure if I like it or not. It was a weird decision to wear baby blue and orange together...but maybe it's not that bad. What do you think? 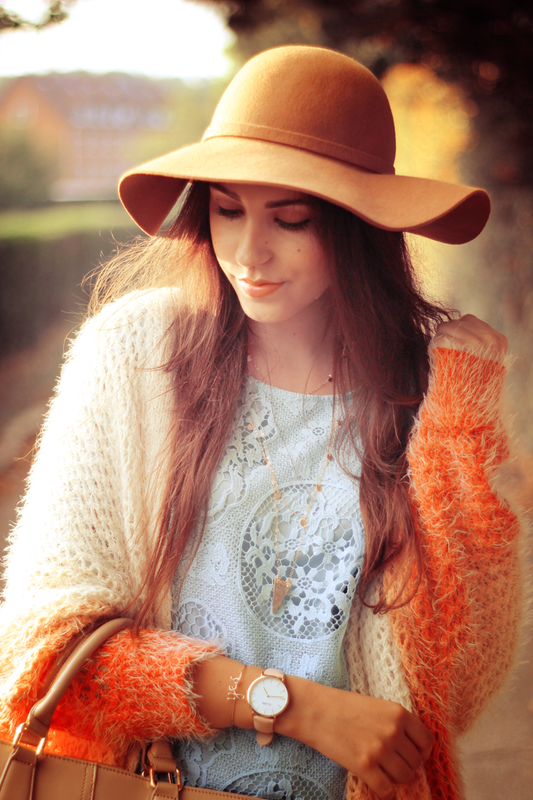 Love the ombre effect on your cardigan, lovely outfit! I think the baby blue and orange look great together. You look so lovely and chic ! Such a pretty outfit ! How pretty is this look? I absolutely love the sweater. Very pretty! Love this look! Gorgeous look, I love that beautiful hat. Loving the shades of colours here! You look so beautiful...! The cardigan is really great. Tavo outfit'ai nerealūs! Vienas iš geriausių blog'ų tavasis! I'm not really a fan of the colour orange, but I think that blue and orange do really go great together! It definitely suits you!